You will certainly enjoy camping season with your larger family when you have this Minnie Plus hitched up and ready to roll! With two slides, and two private sleeping spaces, and dual entry into the full bathroom, you might be seeing double! The bunkhouse features a 48" x 72" lower bunk and two upper bunks, plus a door for privacy. You will find furniture in the main living area to relax and visit with the cook in the L-shaped kitchen. You can opt for a 64" sofa sleeper in place of the theater seating if you need even more space for overnight guests. And, when it comes time for feeding your entire crew, let the outdoor cooktop and sink make it easy to accommodate all of your hungry campers. 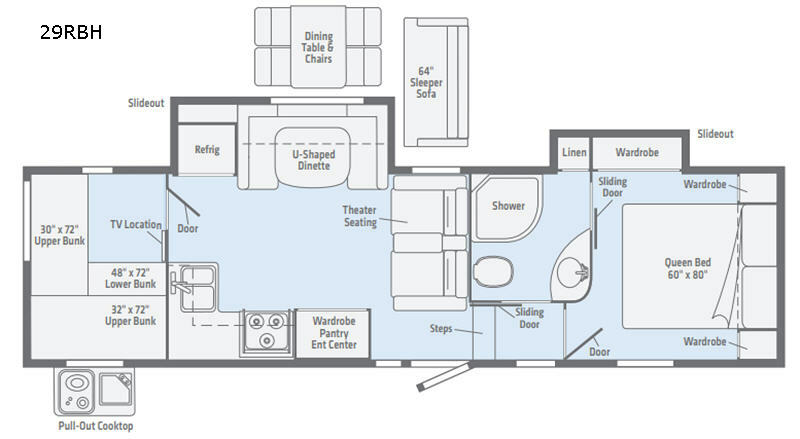 With any Minnie Plus fifth wheel by Winnebago Industries Towables you will enjoy sleeping on a queen bed with dual access to the bathroom, and relaxing under the power awning with LED lights. Each model is towable by most half-ton trucks, and offers several exterior color choices. 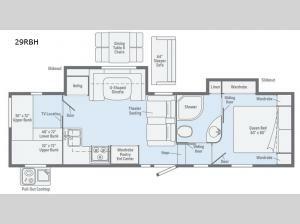 You will find plenty of storage throughout, so dream big and stay awhile!